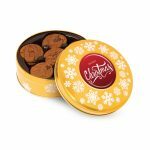 Gold share tin filled with Belgian chocolate cookies and branded with a full colour dome on the lid. WHEAT flour (WHEAT flour, calcium carbonate, iron, niacin, thiamin), sugar, vegetable oils (rapeseed, palm). Dark chocolate chunks (sugar, cocoa mass, cocoa butter, emulsifier: SOYA lecithin; natural vanilla flavouring), Fat-reduced cocoa powder, invert sugar syrup, skimmed MILK powder, raising agents; sodium bicarbonate, disodium diphosphate), salt, natural flavouring. Nutritional Information, typical value per 100: Energy 2150KJ/514kcal, Fat 26.9g, of which saturates 9.3g, Carbohydrates 62.1g, of which sugars 35.1g, Fibre 1.9g, Protein 4.9g, Salt 0.92g. For Allergy Advice see ingredients in BOLD. Produced in a factory which handles tree nuts (not peanuts). Store in a cool, dry place.